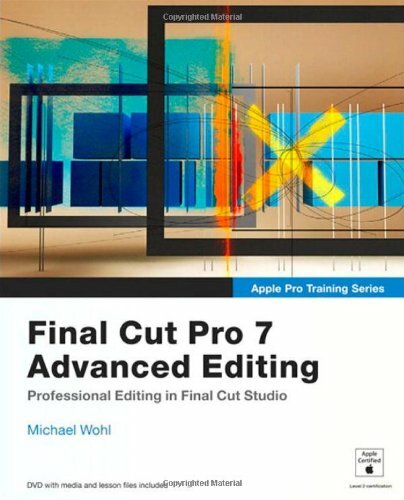 In this Apple-authorized guide, director and filmmaker Michael Wohl teaches the advanced skills that editing professionals need to know most. Using professional broadcast, documentary, and dramatic footage, Wohl delivers a comprehensive course in video editing and finishing. Readers will learn how to create polished transitions, fix screen direction errors, edit multi-camera projects, work with nested sequences, create fantastic effects, use filters creatively, and composite like a pro. Also covers advanced workflows for managing clips and media, and working with film. Michael Wohl is an award-winning filmmaker who has written, directed, and edited independent films for more than fifteen years. As part of the original Final Cut Pro engineering team, he helped design the workflow and interface that has earned Final Cut Pro its award-winning reputation. As an instructor, Michael teaches and designs curricula at UCLA, and has taught at AFI and San Francisco State University. He has spoken at film festivals and conferences including Sundance Film Festival, South by Southwest, DV Expo, Macworld, and NAB. His books include Apple Pro Training Series: Final Cut Pro 6: Beyond the Basics and Apple Pro Training Series: The Craft of Editing with Final Cut Pro.